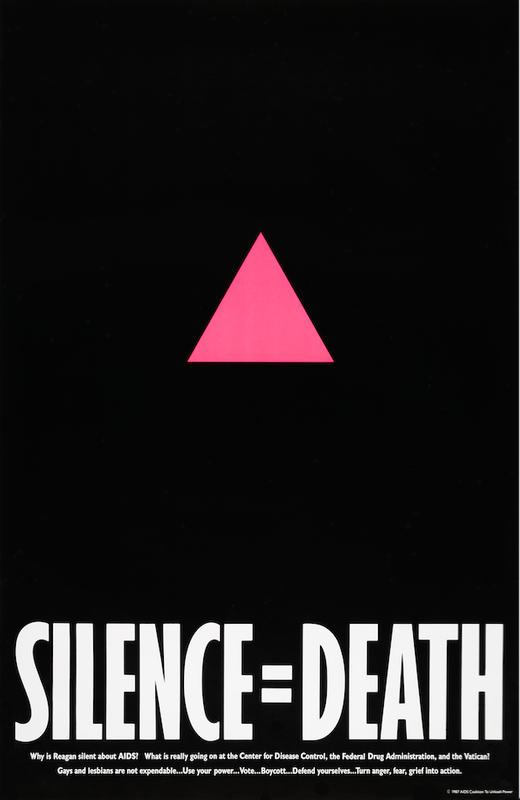 Early in the 1980s AIDS epidemic, six gay activists created one of the most iconic and lasting images that would come to symbolize a movement: a protest poster of a pink triangle with the words “Silence = Death.” Here, Avram Finkelstein, cofounder of the collective Silence = Death and member of the art collective Gran Fury, reveals the process behind some of the most iconic protest artwork associated with the early years of the pandemic. 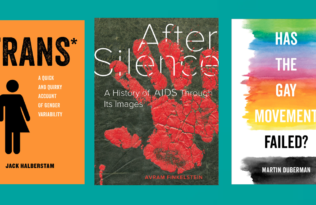 #WorldAidsDay & #DayWithoutArt. Silence = Death, The Silence = Death Project, 1986 poster, offset lithography, 33 1/2 × 22 in. In 1981, the man I was building my life around started showing signs of immunosuppression, before AIDS even had its name. By 1984, he was dead, a year before Rock Hudson was outed by the disease and died, and years before Reagan ever uttered the word. It was a time I felt very alone, so in late 1985 I co-founded a men’s consciousness raising group with five friends. 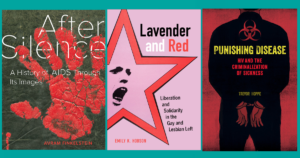 We met every week, loosely assembled around feminist organizing principles. 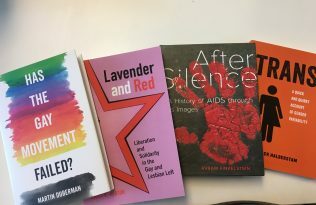 We began each session by talking about our new lives in the age of AIDS, but by the end of every meeting we were talking about the political crisis that was forming. Because of my upbringing, the political poster had always played a role in my understanding of social change, but to be young in the late 1960s was to be political anyway. By 1968, the East and West Villages in New York were papered with manifestos, meetings announcements, and demonstration flyers. When young people needed to communicate with each other, we used the streets. 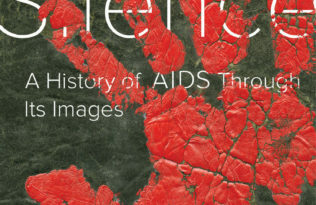 So I proposed we do a poster about AIDS. We worked on the poster for months, and put it to bed in late 1986. I had no idea what might happen, but I knew we couldn’t be the only ones who were enraged. We weren’t. Within weeks of our posting them in early 1987, the activist community it came to represent formed, ACTUP (AIDS Coalition To Unleash Power). 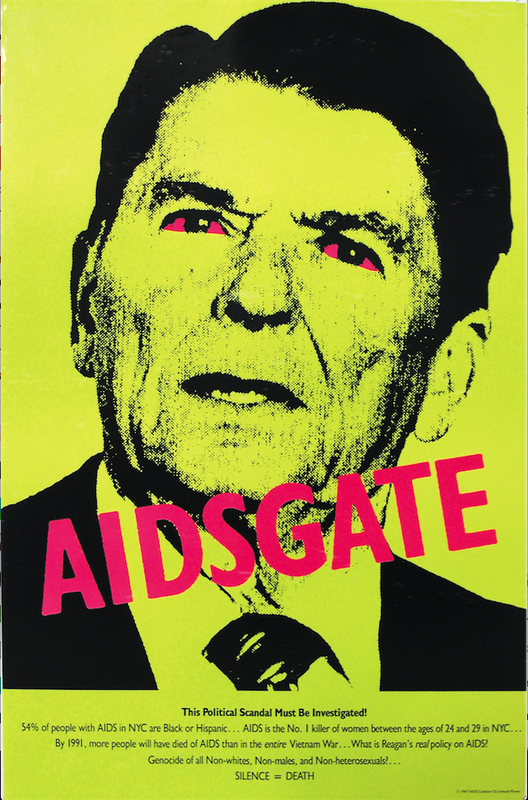 AIDSGATE, The Silence = Death Project, 1987 poster, offset lithography, 34 × 22 in. When collective member, Oliver Johnston (1952-1990), was finalizing the mechanical for the printer, he unilaterally decided Reagan didn’t look evil enough, and made his eyes hot pink. I’m convinced it is the sole reason this poster was included in the 2012 Metropolitan Museum of Art Andy Warhol exhibition, Regarding Warhol: Sixty Artists, Fifty Years. 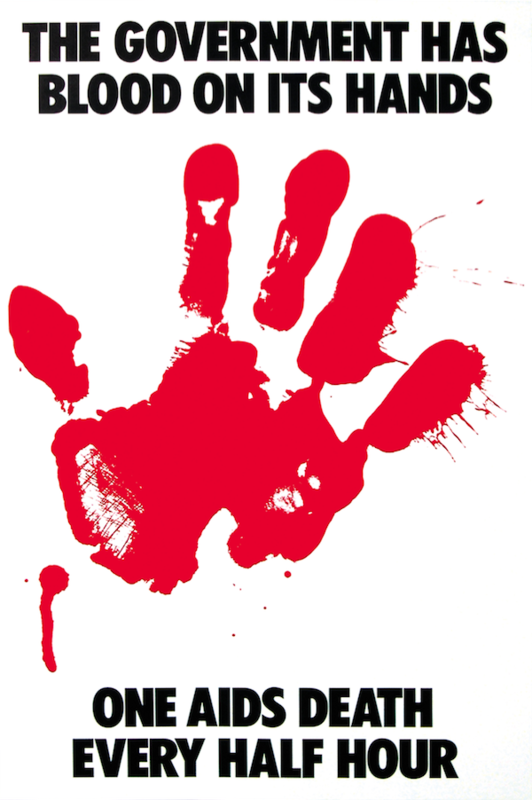 The Government Has Blood on Its Hands, Gran Fury, 1988, poster, offset lithography, 31 3/4 × 21 3/8 in. On July 19th, 1988, the New York City Commissioner of Health, Stephen Joseph, suddenly halved the number of estimated AIDS cases in NYC, a move that threatened to drastically reduce funding for AIDS services. The cut was purportedly based on cohort studies in San Francisco’s gay community. That same year, ACT UP decided to target the regulatory agency responsible for the testing of potential AIDS therapies in the US, The Food and Drug Administration (FDA). Given the high and rapid mortality rate, it had become clear that any risks the medications carried could not exceed the risks of non-intervention, and that the clinical trails for the safety and efficacy of these drugs were de facto healthcare for individuals confronting the fatal disease. Gran Fury, nationalized the bloody hand specifically for the FDA action the statistic “One AIDS Death Every Half Hour.” The FDA action was the turning point for the AIDS activist movement, leading to the streamlining of the drug approval process, the parallel track drug access and compassionate use protocols, and the inclusion of People Living With HIV/AIDS, people of color, and women on research advisory boards. 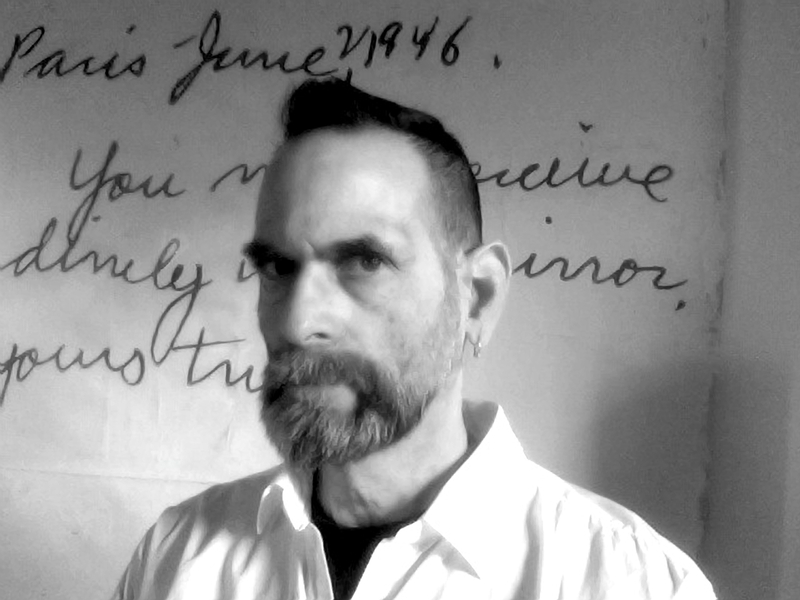 Avram Finkelstein is a founding member of the Silence = Death and Gran Fury collectives. His work is in the permanent collections of the Museum of Modern Art, the Whitney Museum, the New Museum, and the Smithsonian Archives of American Art. 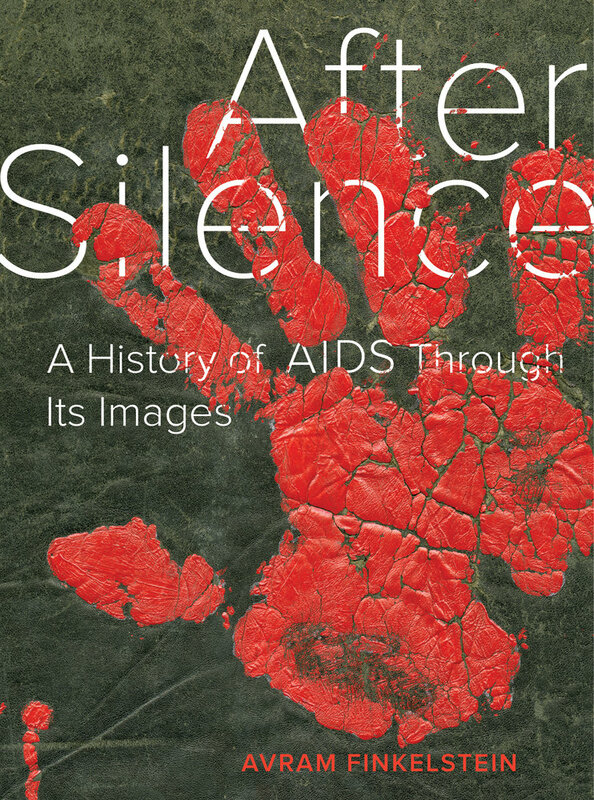 His book, After Silence: A History of AIDS through Its Images , is available now.